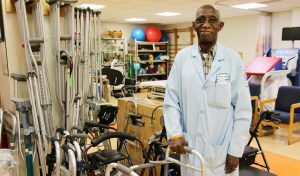 Patrick Duke with physical therapy equipment he uses to help patients. 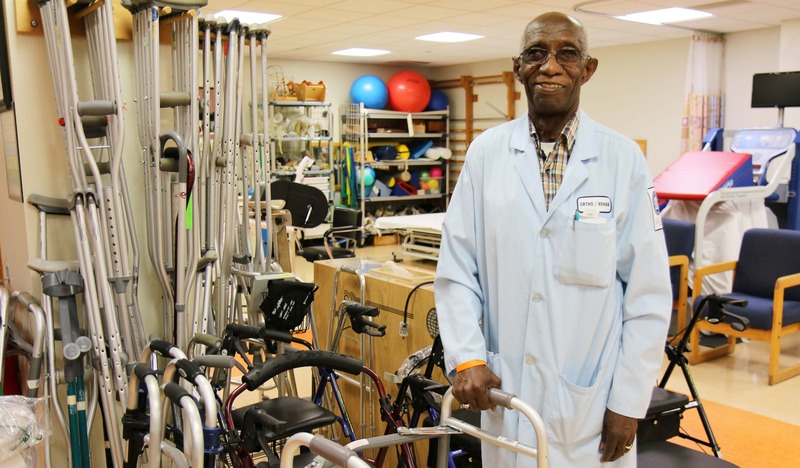 BROOKLYN — SUNY Downstate has its very own Duke, and he’s been helping patients get back on the saddle for 50 years. 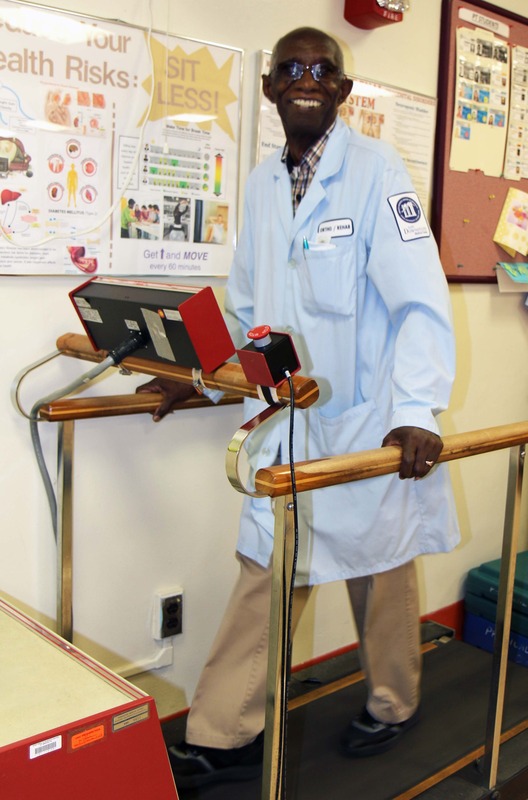 Patrick Duke, 81, has been working as a physical therapy aide at SUNY Downstate since 1967. He arrived in the United States with his family from Guyana at age 10 and quickly became interested in pursuing a career in the health professions. While he’s learned most of his skill while on the job, there’s one skill that’s all his own. “I love patient relations,” said Duke, who has seen literally thousands of patients during his half century at the hospital. Duke and his co-workers not only provide health care, but they are key to keeping their community healthy. As a public hospital, SUNY Downstate serves as a ‘safety net’ facility that provides vital health services to underserved neighborhoods in central Brooklyn. But as much as Duke has helped patients get back on their feet, he lamented that the hospital administration was not as supportive of workers as it had been when he started. Even with challenges, Duke still takes pride in his work and his relationships with patients. Patrick Duke demonstrating a treadmill he uses to help his patients. It’s the way he’s operated as a worker and proud CSEA member throughout his career. He fondly recalled the time a popular patient came to see him for therapy. “He looked at me and I could tell he was thinking, ‘what is this old man going to do for me?” said Duke, smiling. Within a short time, not only did Duke help him walk again, but the patient now requests Duke whenever he comes for follow-up visits. “He’s a good patient,” said Duke. Duke has been a very good worker. His disciplinary record is spotless, which is not lost on SUNY Downstate Local President Althea Green. “Mr. Duke makes me proud to know him,” she said. “It’s a pleasure and boring because I need trouble some times,” said Green, jokingly. Duke walks two blocks to work daily and maintains that staying active has been helpful to his longevity on the job. He also played outfield and managed the hospital’s softball team when he was younger. Over the years, Duke has always been supportive of his union, especially on the many occasions that they have tried to close his department and even the hospital. “I have no regrets,” said Duke.